Charlotte continues to grow younger each and every day. After months of rehabilitation, she's a healthy and slender 40 pounds. She is as sharp as a tack and very alert! Her face is soft and worry free. Her big, brown, grateful eyes are bright, clear, and full of life. Her hearing is keen. Her coat is silky, and her skin is soft and pink. Her blood panel is optimal. Unfortunately, the years of obesity have left Charlotte with significant arthritis. However, with the help of daily supplements and anti-inflammatory medicine, she moves comfortably and happily about. 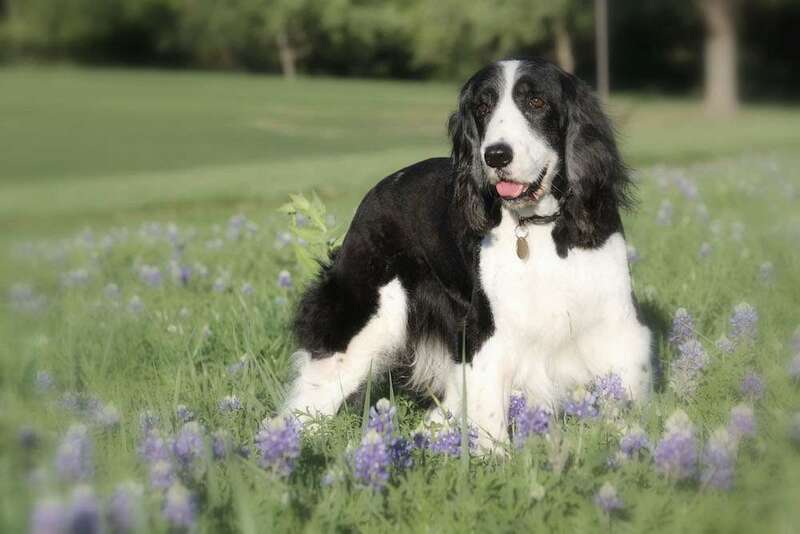 She enjoys her daily strolls around the yard, her jaunts over the rocks, and her explorations in the flower beds. She takes the stairs like a champ! At night, Charlotte patrols the yard for critters, keeping them at bay. She barks loudly, and she greets everyone with an exuberant full-body wiggle. Emotionally, she continues to blossom, experiencing human love and affection likely for the first time. Her foster family has formalized her adoption, making this amazing old gal a part of their family. Miss Charlotte has finally found health and peace. ESRA was able to pick up the pieces and put Miss Charlotte back together again. 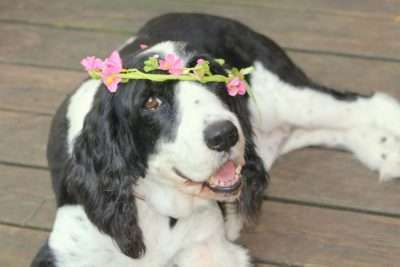 She is now whole, the dog she was intended to be, and she serves as the beautiful inspiration behind "Charlotte's Senior Fund," an initiative by the Clayton Nation online community to support ESRA's commitment to senior Springers in need. Please consider contributing to Charlotte's Senior Fund to help ESRA continue to welcome these deserving seniors in desperate need, changing their lives forever.